Okay, I’m just going to have to give in and get this book. I trust your opinion. 🙂 And yes, that did show class on Vaccaro’s part. But you have a lot of class as well. P.S. – looks like both the Mariners and Yankees are at the same place right now – one win, one loss… fingers crossed for both of them! I looked for the book at Border’s the other day. This might explain why they didn’t have it. Keith, maybe Mr. Vaccaro shares my outlook on grudges. They tend to be quite heavy, so I try to be selective about which ones I carry around with me. I?ve deemed a handful worthwhile, as they bring me joy that more than compensates for the burden. However, for the most part, I find that I feel better holding my head high and just being nice to all things human. Another possible explanation is that Mr. Vaccaro realizes that if everyone thought he was perfect, he probably would never get any better. I for one can respect a tough critic, and few things make me more suspicious or annoyed than someone who never questions me. That was, indeed, a very classy thing for Mr. Vaccaro to do. I re-read your review of his book, and it focused on factual errors, rather than any personal attacks. So, apparently, he must also be big enough to be able to accept constructive criticism. Good for him. I hope you’re managing to cope with your grief as much as can be expected in these circumstances. As I’m sure you know too well, grief lasts far longer than the initial wave of condolences, and one can often feel alone because they think everyone else has forgotten about their grief. But don’t worry; we’ll still be thinking about what you’re going through, even if we don’t mention it for fear of inspiring a fresh wave of sadness. I’m 3/4 through the book – will probably finish it tonight – and I’ve loved it as much as you promised I would! I’ve laughed a ton and wiped away a few tears already. Thank you so much for highlighting it. Hayhurst is such a talented writer – of course it helps that I live in San Diego and am a Padres fan and know Lake Elsinore as well as I do 🙂 Still – this is so much more than a baseball book. Kudos to Mr Vaccaro. Very nice of you to share that encounter. Keith, now that had the makings of one of those a-box-to-hide-in moments. Crikey! Still, it was an encouraging reminder that two people who have professional differences can manage to be kind to one another, especially when one of those people is grieving a tremendous loss. Props to Mr. Vacarro for his humanity and decency. 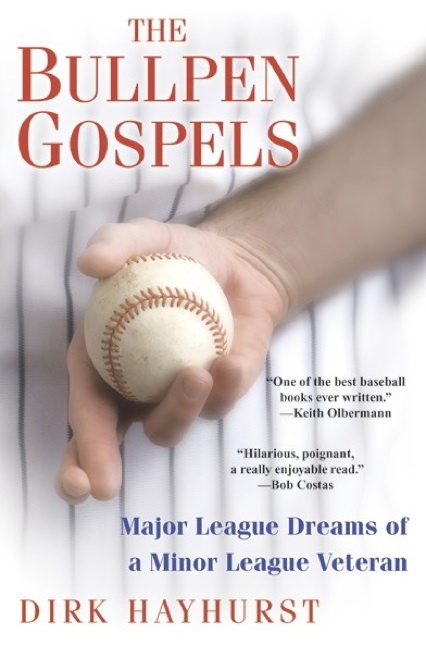 I just read your review of The Bullpen Gospels, as well as the user reviews at Amazon.com. Wow. Dirk Hayhurst sounds like a guy I would enjoy knowing. Time for recreational reading has been hard to come by lately, but judging from the raves about Hayhurst’s gifted writing, I’ll have to make it a point to carve out some time to really savor this book. Delicious reference to Thurber’s fable ?The Bear Who Let It Alone? on Countdown a couple nights ago! 😉 Thurber sure packs a wallop in just a few short paragraphs. Hey Keith… welcome to Twitter! Sent you a brief message there… and I’m sure you’ll see it, buried somewhere within the other 3,475,092 messages you have likely gotten in this, your first hour on the site. 🙂 Go Yankees! Go Mariners! I tweeted you too. I’m new to this thing, so hopefully my tweet didn’t vaporize in cyberspace. I’m gonna have to hire a 5-year-old to show me how to do this. Uggghhh! Having checked out just a little of Mr. Hayhurst’s Twitter feed this evening — accessed of course through Keith’s shiny new(ish) Twitter page — I feel confident in saying that Dirk will remain in a state of giddiness, oh, for the rest of his life or so. It seems to have come pre-installed. I don’t know why, but somehow after all of KO’s raves about the book, I never quite got the full sense of what a winning & charming personality he has — just full of life & creativity & drollness. (The Holden Caulfield comparisons may have thrown me off.) And he’s coming to NE Ohio to sign books next weekend! Sorry for the digression, Dirk’s book brings back a lot of good memories. Any way, I sent him a email, telling him how much I enjoyed the book and such, and I was stunned when I received a reply! Now, I have met a few authors, Toby Wolff and Jess Walter to name two, but to get a email from a bestselling author, that was surreal. I am looking at Toronto’s schedule to see when the Jays will be on the west coast, and his stint on the 60 day DL will be up. I just have to shake this man’s hand. Can you and your producers come up with a reason to interview him on Countdown?